There are plenty of studies on how petal colour varies, but new research looks at differences in the performance of pollen under varied environmental conditions based on its colour. In the study of the North American herb Campanula americana, published in New Phytologist, investigators found that differences in heat tolerance among pollen colour variants could contribute to geographic variation in pollen pigmentation across the USA. 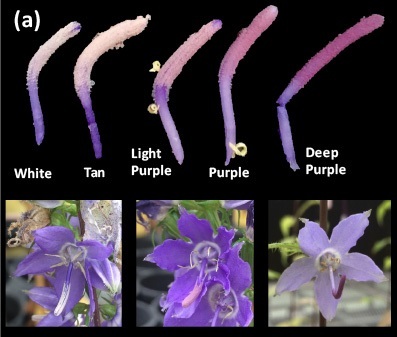 Pollen colour in Campanula americana varies from white to deep purple.